Monitoring the training loads that athletes experience in training sessions and during competitive events has become a major focus in professional sports. Interest in athletic load has been gaining attention, however identifying an appropriate methodology that has the capacity to quantify and provide meaningful results is challenging . Measures of training load can be categorized into either external or internal. External training load is a measure of work performed by the athletes during training and competition quantified using position-based devices (e.g. accelerometer and GPS). Internal training load is a measure of biological or physiological stress imposed on the athletes and is assessed using biological or physiological sensors (e.g. EMG-based garment, metabolic consumption device). The internal training load reflects how athletes’ physical capacity is responding to a training program, and the external load is quantified independently of the physical capacity. External load is easily misinterpreted either during analysis or in communication to sports practitioners. A disadvantage of external load is that the interpretation from external loads could be misleading, and this becomes evident when comparing equivalent loads between individuals. For example, two individuals may traverse the same distance when running (measured with GPS), however they may experience different physiological stresses due to differences in individual physical capacities (i.e. VO2max). Therefore, decision making on player availability for training or competition based solely on external training load should be executed with caution. Internal training load directly measure the physiological stress imposed on athletes such as heart rate, blood lactate, and oxygen consumption. 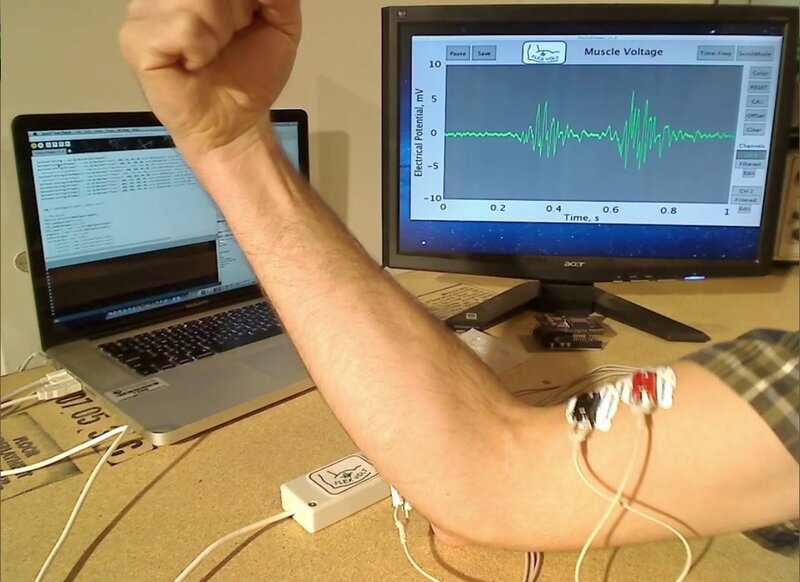 Moreover, current technology has advanced to allow sports scientists and performance coaches to monitor individuals’ muscle activation using ATHOS’ electromyography (EMG)-implemented garments. EMG is a commonly utilized tool in the scientific community for the assessment of muscle function that associates with motor control strategy and physical stress. In fact, it has been demonstrated that integrated EMG (iEMG) of quadriceps and hamstrings muscles are associated with oxygen consumption [2,3], suggesting that measures of internal load may be good tools for reporting individuals’ exertion. From athletic performance and clinical perspectives, the changes in muscle activation that occur with an increased metabolic demand offer insight into training and rehabilitation strategies for healthy individuals and also those with injuries. While the correlation between iEMG of the thigh muscle and oxygen consumption is established, it is not known if the ATHOS training load quantified using EMG-implemented garments reflects this correlation. The purpose of this study was to investigate the feasibility of implementing ATHOS EMG-based training load as well as current accelerometry-based external training load as a surrogate of oxygen consumption. Establishing the correlation between training loads and oxygen consumption will provide coaches with an improved method to assess athletes’ training responses. 10 healthy and physically active collegiate athletes performed the VO2 max test using an incremental treadmill running protocol. All participants completed a standardized warm-up session before the VO2 max test. During the VO2 max test, participants ran at a consistent speed (10 km/hr). Treadmill inclination started at grade 1 and increased every minute until the participants reached their VO2 max. All participants were attached to a calibrated metabolic cart and wore ATHOS EMG-based training load garments (ATHOS, Redwood City, CA, USA) as well as accelerometry-based training load vests (Catapult Sports). External and internal training loads and VO2 measures were recorded every minute during the VO2 max test. Data analysis All three variables were time synchronized for data analysis. External training load from the accelerometry-based monitoring system and the VO2 measure over one minute were averaged every 1-min interval during the VO2 max test. VO2 measure was normalized to VO2max (%VO2max). Internal training load was quantified as the sum of the iEMG of four muscle groups bilaterally (vastus lateralis (VL), medialis (VM), biceps femoris (BF), and gluteus maximus (GM) over the course of testing. For the data analysis, the internal training load was calculated over the same 1-min interval. Statistical analysis Separate Pearson’s product-moment correlations were used to determine the correlations between ATHOS and the accelerometry-based training loads and %VO2max (composite and individual data). Significance level was set at .05. When considering the composite data, a moderate positive correlation (r = 0.30, p = 0.02) between ATHOS training load and %VO2max was found in the composite data set. Higher ATHOS training load was related to higher %VO2max during the incremental treadmill running. However, no significant relationship (r = 0.09, p = 0.41) was found between accelerometry-based training load and %VO2max. In addition, when considering individual data, ATHOS training load demonstrated the positive relationship, ranging from .80 - .96, in eight participants. 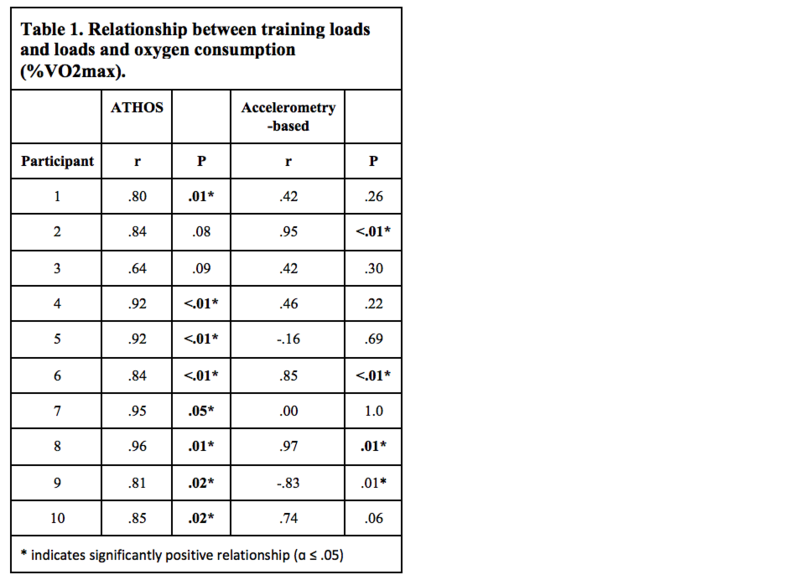 The accelerometry-based training load only demonstrated the relationship in three participants (see table 1.). iEMGs of quadriceps and hamstring muscles have been demonstrated to have a positive relationship with oxygen consumption . Understanding actual physical responses to training may provide information related to the level of training and muscle capabilities that can be used in performance and clinical settings. The present study, investigating the feasibility of monitoring oxygen consumption using ATHOS EMG-based garments, found that the ATHOS training load demonstrated a significantly positive relationship with %VO2 max during incremental treadmill running. However, the accelerometry-based external training load did not reflect the actual physical stress imposed in the participants. Data from the present study also indicates that the relationships between ATHOS and accelerometry-based training loads and %VO2max for the composite data (n = 10) were inconsistent with the individual patterns. Specifically, ATHOS training load consistently demonstrated a significantly positive relationship with %VO2max in 8 out of 10 participants (r = .80 - .96), but the accelerometry-based external training load only demonstrated the positive relationship in three participants (see table 1). In addition, the higher correlations found in individual data suggest that ATHOS training load can be a valid measurement for quantifying physiological stress during training and competitions. When considering individual participant, ATHOS training load increased (dashed arrow in figure 1a) with increased %VO2max (solid arrow in figure 1a) required during incremental treadmill running, while the accelerometry-based external training load did not (figure 1b). When the %VO2max during the test indicated an increased internal physical stress imposed on the participants (red arrow in figure 1b), the accelerometry-based external training load remained the same (blue circle in figure 1b). It is suggested that the accelerometry-based external training load may not reflect properly an athlete’s exertion during physical activities. Monitoring athletes’ training load is imperative for sports practitioners to better understand athletes’ responses to training in order to develop better practice regimens and rehabilitation programs, or even a game plan. The accelerometry-based external training load does not provide the information of how individuals are responding to the external workload placed upon them during training or competition. One can imagine that athletes repeating the exact same movement will more than likely generate the same external load, but experience vastly different internal loads to achieve the same outcome, especially in the presence of fatigue. Failure to appropriately monitor the stress imposed on athletes physically and physiologically may under- or overestimate their performance, and as a result, it may lead to improper decisions made solely on the accelerometry-based training load monitoring system. The present study, demonstrating the feasibility of using ATHOS EMG-based training load as a surrogate of oxygen consumption, suggests that the EMG-based training load metrics better reflect athletes’ individual physical exertion levels. Moreover, it is suggested that an integrated approach, combining internal and external training loads should be considered to provide greater insight in developing physically challenging training programs and sessions tailored to individual athlete. The ATHOS Training system, combines both EMG and positional metrics, may help athletic coordinators and coaches understand your athletes’ capabilities with more precision. At ATHOS, we build better athletes! Bourdon H. Cardinale M. Murray A. Gastin P. Kellmann M. Varley M. Gabbett T. Coutts A. burgess D. Gregson W. Cable T. Monitoring athlete training loads: Consensus Statement. Int J Sports Physiol Perform , 2017. Kyrolainen H, Belli A, Komi PV. Biomechanical factors affecting running economy. Med Sci Sports Exerc 2001;33:1330–1337.